To make everything as tall as I wanted, I colored 8 giraffes and layered them behind the dp, and I just noticed that I didn't get all of the legs lined up with the rest of their bodies. A little more abstract than my intention (Picasso?). Oh, the details. I think I need to take a break from trying to be all clever for submission calls. The magazines seem to want the latest products, which gets to be a HUGE investment after a while. So instead, I'm working on clearing out the hoard. Jen at The Sparkle Within posted a 6x6 pad tutorial to use up paper with very little waste, so that's been my goal lately. Thanks Jen! The deacons at church work with Meals on Wheels to provide all occasion cards, stamps, and pens to the meal recipients, so that's what I've been doing. Still haven't made a dent, though. 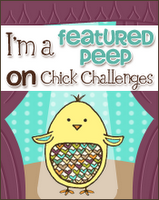 Chauffeuring the kids has taken away from my crafting time, darnit! Your card is super sweet. Love the giraffes. How adrobe the little giraffes. Are so cute. Oh, this is adorable! Are the giraffes stamps? I know what you mean about using up the stash...I should schedule some time this weekend to blast through a few piles...fun! very cute , I love giraffes !!! Awwe this is cute ! I love the giraffes. I don't think I would have noticed they don't line up if I hadn't read your comment. Maybe they're just leaning? 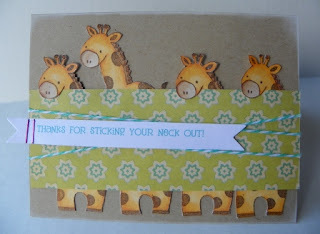 What an adorable and clever card, love those giraffes! Maybe they are standing on another row of giraffe's shoulders? Well, maybe...... so cute! Your giraffes are so cute! And I totally understand working through your stash, that is what I am doing too.